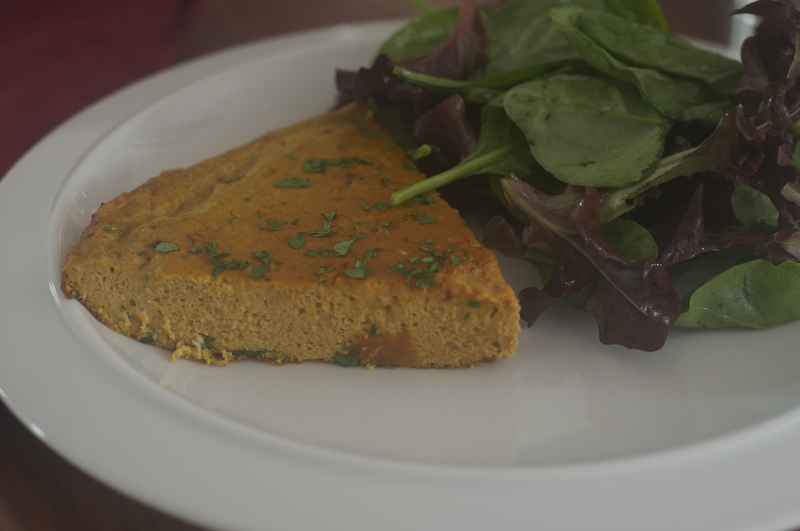 I’ve thought about making Martha Rose Shulman’s spicy Tunisian carrot frittata at least a dozen times. Whenever I paged through her book, The Very Best Recipes for Health, the frittata’s brilliant color smiled at me and its spices winked. But I could predict The Professor’s enthusiasm — or lack thereof. “Another time,” I’d tell myself. Well that time finally came — last weekend, when friends were coming over for brunch. After I’d pureed a pound of carrots and mixed them with the eggs, and made some harissa (using a recipe I found online and making a few substitutions for ingredients that I didn’t have), I began to worry. Home-made harissa? 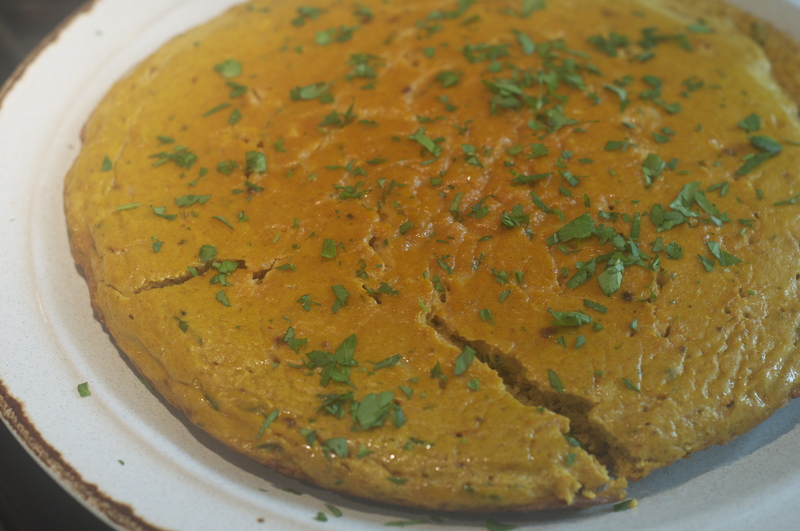 Carrot frittata? Why was I serving my friends such an experiment? My mother would never be so foolish. Damnit. This is not your average frittata — a wedge of eggyness studded with vegetables, cheese, whateveryourpleasure. The spices give the dish some surprising zing (surprising for a frittata, at least). The heat of the harissa nicely balances the sweetness of the carrots, and the flavors suffuse the dish. So I’ll be thinking about something else to serve with the frittata that would push it over the fence into A territory. Last week my dear friend Helen was in town and she came over for dinner. “What do you want to eat,” I had asked her, in preparation. “Something that you can write about for your blog, of course,” she responded. Helen is a vegetarian. She is also British, which means she grew up eating things like bangers and cottage pie and other euphemisms for … well, let’s not go there. In any case, I’d meant to ask Helen why and when she became a vegetarian but I forgot. I suppose it was because she grew up eating bangers. 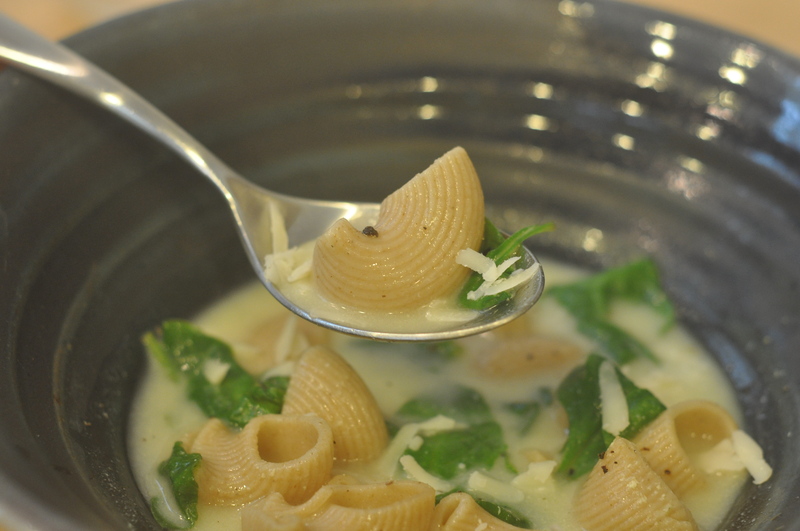 In any case, the morning of her visit was cold and wet so I decided to make Martha Rose Shulman’s Rich Garlic Soup with Spinach and Pasta Shells for dinner. “OK,” he replied, still skeptical. For a meatless, creamless soup, the broth really was quite tasty and rich, thanks to the addition of four egg yolks. “It tastes good,” The Professor said. “Though I’d still call it subtle. Subtle! It has damn near thirty cloves of garlic in it! I thought to myself, and turned my attention to Helen. But The Professor continued his critique. 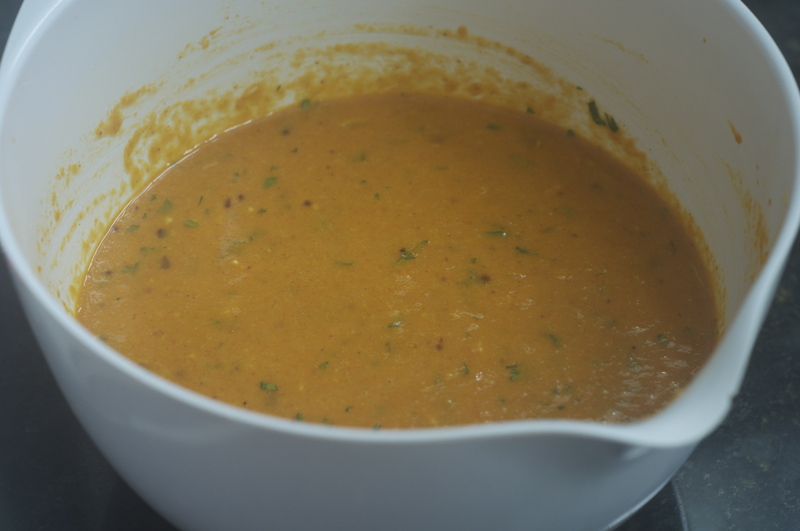 The soup’s main flaw, to his mind, was the toasted bread, which the recipe calls for putting in the bottom of the bowl, sprinkling with grated Gruyere, and then topping with the hot soup. Inevitably, the bread turns mushy, and The Professor can’t abide mushy. I think the soup is worth trying again — with the bread simply sliced for dunking into the soup, or cubed for sprinkling on top. 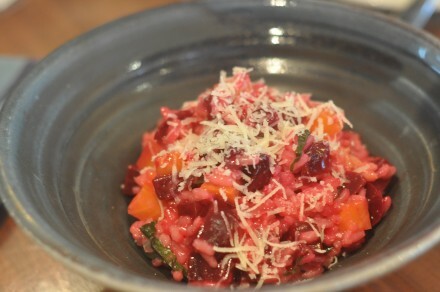 This blog, as many of you know, was named for Martha Rose Shulman’s beet risotto. I’ve usually made it with red beets, but last night I used a combination of red and golden and it was beautiful. Last night I cooked Martha Rose Shulman’s spinach and fresh herb frittata with walnuts and yogurt from her book, Recipes for Health. Shulman describes it quite wonderfully as “a little garden” and she’s right. 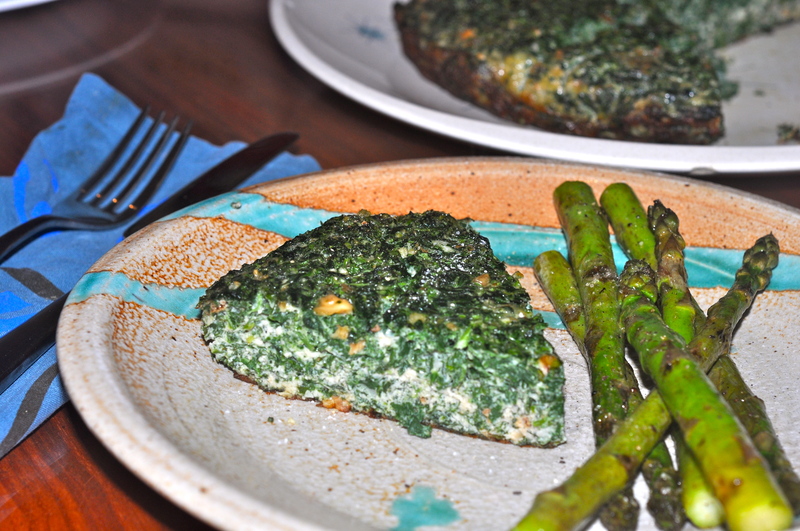 It is just packed with flavorful greens. I thought it was delicious. But The Professor … well, not so much. I decided not to ask him for a grade. But he did explain what he liked and didn’t like about the dish. The big problem was the flavor — it turns out that The Professor doesn’t like mint and I had added a generous handful, along with some tarragon and almost a full bunch of parsley. “Mint should be used sparingly,” he said. Mint should be used sparingly! Did he think he was some kind of Kitchen Oracle? Offering cooking koans? I was starting to get angry. ‘What about mint tea and mint chocolate chip ice cream?” I thought to myself. Peppermint Patties and Candy Canes! Explain that, Mr. Kitchen Oracle! But before I said anything, The Professor started talking about what he liked, and he did like the basic idea, which he described as something between a frittata and a quiche. 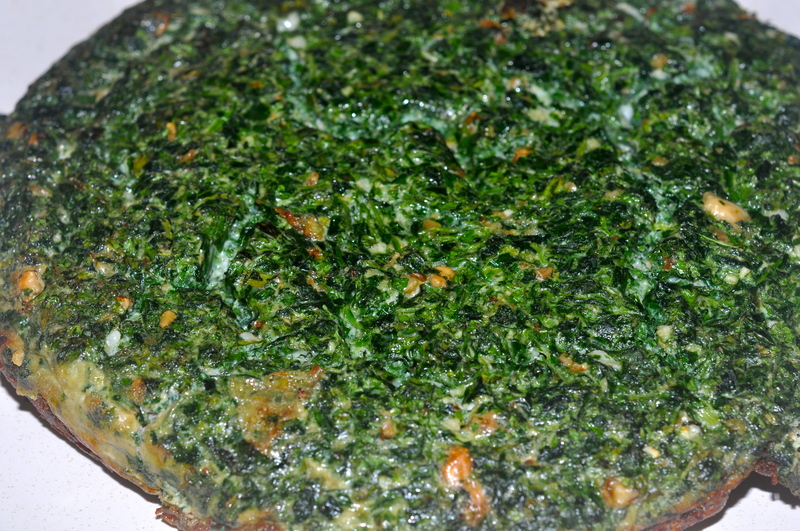 He liked that the spinach and herbs had been chopped fine and mixed well with the eggs so that every bite had lots of flavor. He liked the crunchiness of the walnuts. He said it was worth trying again. And I will. In the meantime, here is Shulman’s recipe. I used five eggs and one cup of egg whites rather than eight whole eggs. If you try it, let me know what you think. 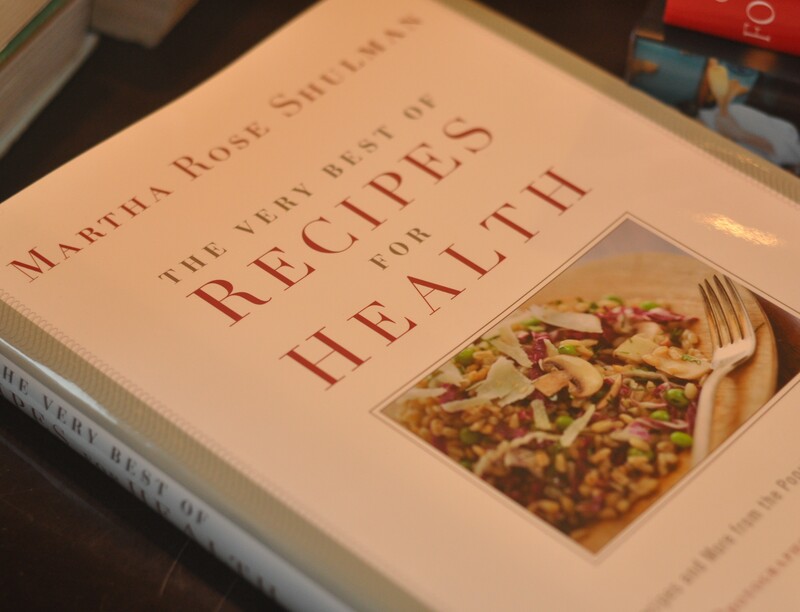 I just bought Martha Rose Shulman’s book, The Very Best Recipes for Health. I’m an avid reader of her column for The New York Times, “Recipes for Health.” In fact, it’s where I found the recipe for beet risotto that launched this blog, so I consider her a sort of Patron Saint of The Roasted Beet. I’ve already gone a bit Post-It-crazy, marking recipes that I want to try — White Beans with Pesto, Garlic Soup with Spinach and Pasta Shells, and a Spicy Tunisian Carrot Frittata, among others. The book includes a whole chapter on vegetarian main courses! I’ll write about the recipes as I test them, but in the meantime, I wanted to share a helpful tip (one of many that Shulman sprinkles throughout the book) on using a mortar and pestle to puree garlic. 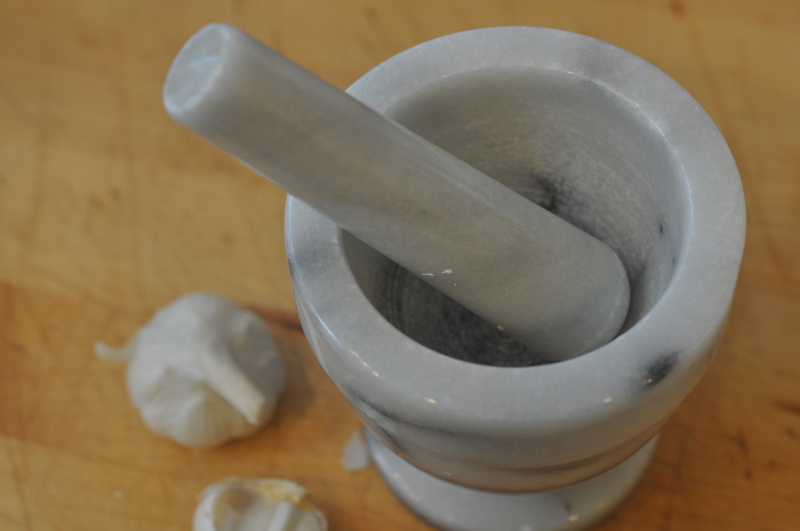 I love my mortar and pestle and often use it to crush garlic. Now I know the right way to do it! Martha Rose Shulman wrote about about beet risotto in The New York Time’s Recipes for Health section back in 2008, though I came across it just last summer. When I first announced that I was cooking a beet risotto for dinner, The Professor gave me his “do you know what you are doing” eye brow raise. I didn’t, but I forged on, figuring that, at the very least, the effort would produce some cooked beets — one of the more nutritious foods that my three-year-old daughter will eat. (Dave Lieberman, a Food Network chef and author of The 10 Things You Need to Eat, calls beets “nature’s multivitamin.”) Despite his initial skepticism, The Professor liked it. So I tried it again, and then another time. And then it inspired my husband’s challenge. The Professor, as I’ve said, gave the dish an A. I’m still trying to analyze what made the dish so satisfying. If you add enough butter or cheese any risotto can feel rich, and I did double the amount of parmesan recommended in the original recipe But I wonder, could there be something about the iron in the beets that makes this dish satisfy a regular meat-eater? The Roasted Beet. RSS feed. Blog at WordPress.com.